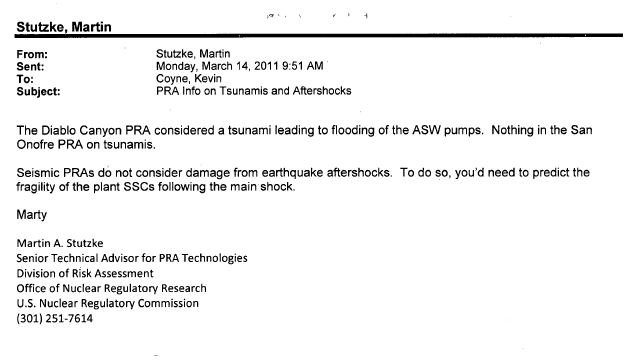 The Diablo Canyon PRA considered a tsunami leading to flooding of the ASW pumps. Nothing in the San Onofre PRA on tsunamis. Seismic PRAs do not consider damage from earthquake aftershocks. To do so, you’d need to predict the fragility of the plant SSCs following the main shock. Here is a write-up for station blackout, in case somebody is looking for it. 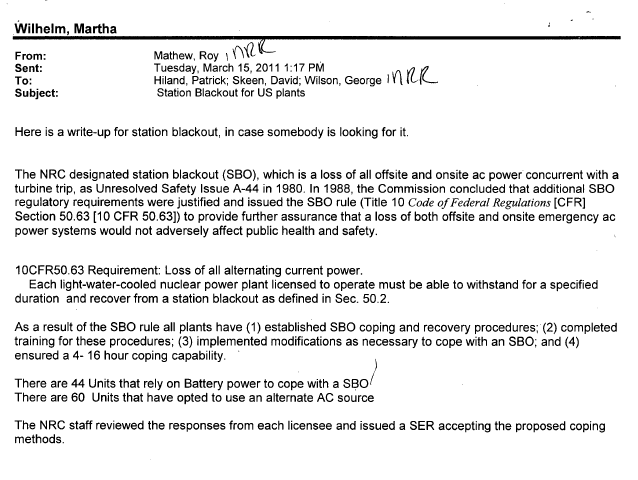 The NRC designated station blackout (SBO), which is a loss of all offsite and onsite ac power concurrent with a turbine trip, as Unresolved Safety Issue A-44 in 1980. In 1988, the Commission concluded that additional SBO regulatory requirements were justified and issued the SBO rule (Title 10 Code of Federal Regulations [CFR] Section 50.63 [10 CFR 50.63]) to provide further assurance that a loss of both offsite and onsite emergency ac power systems would not adversely affect public health and safety. 10CFR50.63 Requirement: Loss of all alternating current power. Each light-water-cooled nuclear power plant licensed to operate must be able to withstand for a specified duration and recover from a station blackout as defined in Sec. 50.2. As a result of the SBO rule all plants have (1) established SBO coping and recovery procedures; (2) completed training for these procedures; (3) implemented modifications as necessary to cope with an SBO; and (4) ensured a 4- 16 hour coping capability.